I have been privileged to know a few people who share doll collecting and creativity in the my passion for dolls, among them is Noel Cruz. We find our commonality in this craft, aside from us being both Filipino. 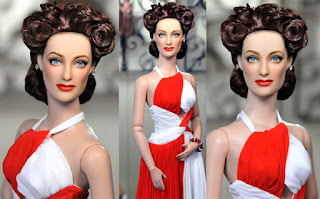 It was Noel who encouraged me to pursue this little passion -- my determination to make the Tonner doll look like Vivien Leigh (at least in my eyes). I would send him pictures of my repaints and he would make comments about them -- generously -- like a master to his student. I know I may never be a Noel Cruz, but what he has shared is one of the greatest treasures I have found in life. The long hours of practice, the grumble everytime I didn't make it right, the symmetry, etc. They were all part of the journey. I am still a practicing student, hoping one day to create my own style but having the realistic impact I desire for doll repaints. I wish I had more time though. Advertising can eat up so much of my time. Noel gave me my first brushes which I still keep and somehow refuse to use extensively. Each one of them is signed by him -- at least, if I can't afford a repainted doll, I have something of Noel Cruz's which I feel are equally priceless. Noel was happy to have been part of Hollywood Ahoy. I believe the organizers of Hollywood Ahoy was lucky to have had him too. I take this little opportunity to share with all of you what Noel has shared with me: a photo of his Hollywood Ahoy Joan Crawford auction doll which went to his friend Suzanne. Lucky lady she is! And since I've mentioned Noel, I also share this with all of you and the rest of my friends who share their passion for dolls or whatever: To Eric Caron whose miniatures are amazing! To Isabelle of Isabelle Repaints who takes time too to share her work with me, to the beautiful Nikki, to Margaret Wallace who at 75 still lives with vibrance and love for life, to Alana Bennett who never fails to bring creative vision to life, and to Margaret Thackston, my friend who makes me always smile with her passion for dolls. And to the little group that follows this blog. I know its not much of a blog I know. But it's my little world that makes me feel happy and makes me love life a little more than I do.